Sometimes, images can be the main reason why the file size of a PDF document is very big. The amount of text may be small but the moment a company logo or masthead is added to the pages, the file size zooms! 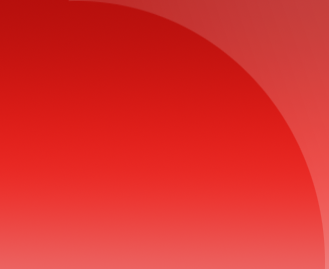 PDFOne .NET employs numerous optimization techniques to reduce PDF file size. 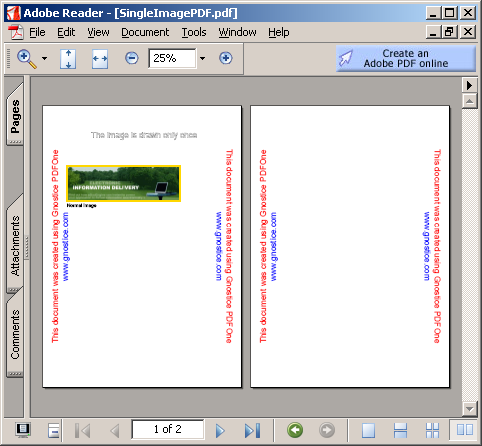 Some of these techniques are provided as part of the PDF format (mainly as compression techniques) while others are PDFOne .NET's very own. In this article, I will show you how PDFOne .NET optimizes the file size when images are rendered multiple times in a document. Imagine a PDF document that uses the same image in multiple locations with different positioning, orientation, cropping and other settings. Now, PDFOne .NET can ascertain that the images are the same, irrespective of what name, path or stream type (file or memory) they are found with, and then intelligently create just one resource for those images in the PDF document. In the following code snippet, a file called "sample.bmp" is used to draw an image. Another file "Copy of sample.bmp," which is just "sample.bmp" with a different file name, is used to draw another image in a different location. PDFOne .NET can identify that these two images are the same and use a single resource for both images when it creates the PDF document. // Draw image from "sample.bmp"
// Draw image from a copy of "sample.bmp"
Even when you use the same image from a different path with a different file name, PDFOne .NET identifies them to be the same! In the following screenshots, you see two PDF documents that use the same image in different ways. If you check the files (available in the downloads section), their sizes are almost the same. The fact that one document has only one image and the other has several does not seem to make much of a difference to the file size. A C# project is provided in the download section. 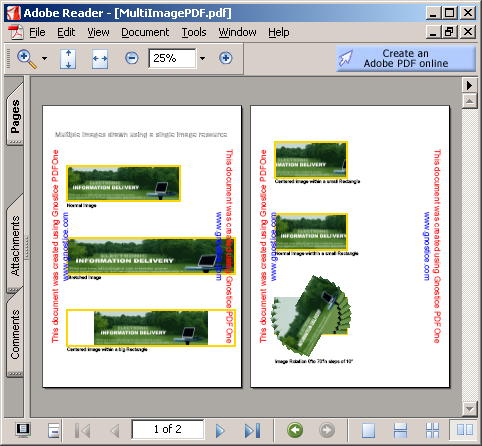 You can create these PDF files on your machine and compare the file sizes.